Related Product Slider For Virtuemart is a plugin that can be used to integrate a slider on your virtuemart product details page. Using this plugin you can create a simple and beautiful slider for your related products or accessories of a products in virtuemart. This plugin is developed using Joomla standard so it can be used for your Joomla 1.5+ Joomla 2.x Joomla 3.x version and all the Virtuemart 2.x versions will support this plugin. The integration of related product slider for virtuemart is pretty simple as follows any non technical person can install and configure the things easily. Then simply enable the related products slider for virtuemart from the plugin manager. Main features of the related products slider for virtuemart are follows. Custom Title option for your related product section. jQuery library load based on user interest. Auto slide enable and disable options. Joomla version supports Joomla 1.5+, Joomla 2.x, Joomla 3.x. Virtuemart 2.x ,3.x all Versions support this plugin. Your basic configuration option for related products slider are shows as below. This plugin will available soon in Joomla Extensions Directory , Don’t forget to write your review and rating on the “Related Products Sldier For Virtuemart Plugin” on JED. Hope this plugin will help to create a nice slider on the product details page of your Virtuemart Store. PRO VERSION FEATURES VM3.x Ready! Manage your related products with beautiful slider. Support third party Virtuemart template(div Class can be add from plugin param). Enable/disable Add to Cart button option. Version support Joomla 3.x and Virtuemart 3.x. How the custom Div option works ? In some template you may face some style issue when you enable the plugin , this can be fixed by enabling custom DIV option . Just create an empty DIV in your override template simply add a class name and set the class name in plugin param and make custom DIV option to Yes. Done! Is this option is helpful ? Yes I guess bcoz using this option you can place related product slider anywhere in the template. Please note : this plugin is not yet compatible for latest VM version (VM 3.0.18) I’m working on it , soon will release an update. Hi, news on 3.0.18 update? hi! Any news on the 3.0.18 update? No news about the 3.0.18 update? I have plan for the bit busy with other stuff will update soon! Thanks for purchasing pro version. The popup is loaded via ajax right ? then its not possible. Bcoz the plugin uses onRender event that will triggered when the page loads. But an alternate way you can achieve your requirement I think. another option is to integrate the slider functionality to your template related products so it works inside popup. (I will look into it and update you if possible). Hi, I can not do it !! You can help me? I have managed to configure the plugin in your site (position: addtcart) you see: “http://www.akitucamiseta.es/tienda/impresion-en-vinilo-de-corte/camisetas-para-hombre/vinilo-corte-modelo -2.html “, and it works. I have also discovered that it is in padded.php where Pop Up is generated. It seems, that is where “related products” are loaded, to appear in Pop Up. I have inserted the code (in padded.php) ” “and appears when the popup is generated. What code should I insert to load the plugin in padded.php? I think the solution would be to include in padded.php a code that will run the slide related products, but not do it. You can help? content at the time of rendering the product page . to add it your template) use my contact form to send personal message. in my template index.php, Is this correct? The Div option can be used to create an empty div with mentioned class in your product page template or event index.php where ever you want. I think it might be a jQuery conflict. When I look at your page their is a jQuery error called $().tab not a function means jQuery is inable to init. It may happen due to enabled jquery twice on the page . If your template already using a jquery then from my plugin just disable the jQuery option to OFF. Then everything works well, another thing is you added only three item as related product it looks like can be fit in a single slide. add more product to related list. thanks for your reply! I followed your instructions, but no changes! Hope you have Virtuemart installed with your Joomla website. On product admin panel for each product you can add related products, and related categories. in last tab, custom fields section. assign few products as a related products to a product, then check the product details page of the product it have beautiful slider features :). make sure my plugin is enabled :). I have ssl enabled on my website and once i enable your extension there is a shield on the address bar, claiming that the extension is poorly made.somethin about unsafe scripts.Can i correct that,or is it your problem? Please check that , my plugin uses any resources from non https . like jquery or cycle.js js that may case this issue. Did you enable the plugin ? I didn’t find the plugin on the page URL. So Please activate the plugin from. Extension -> Plugin Manager – > search for related products. It doesn’t work with VM 2.9.9b. “product-related-products” and “product-field product-field-type-R” for putting the products on the page. so your template may changes these classes. Two option to fix the issue either edit the VM layouts or edit plugin file. If you are planning the plugin file edit. and replaces the classes with your layout file classes. 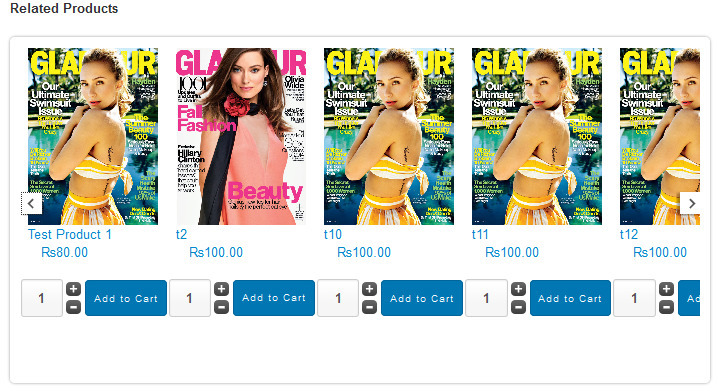 Virtuemart Waiting list Dashboard Module..
Joomla Social Share Icons On Image Hover.. Override Joomla core or 3rd party classe..
Joomla Media File Optimize Plugin..
Virtuemart Calculation Plugin with Custo.. Adding stylesheet and scripts using JDoc..
How to disable Joomla registration compo.. Copyright © 2013.Designed by WalkswithMe.net - A Programmer's Experience On the Web.